If you are looking for a convenient friendly boutique hotel which combines comfortable accommodation with good service, Vincent's Restaurant & The 7 Rooms is where you want to stay. It is located near Lumphini Park and the Night Bazaar in the heart of Bangkok, and it is within walking distance (300 meters) of the Lumpini Underground Station (MRT) which also connects to the BTS sky train network. Vincent's is near many embassies, such as the embassy of Denmark, Austria, Germany, Malaysia, and others. There is easy access to districts such as Sathorn, Silom, Sukhumvit as well as to the expressway leading to and from Bangkok International Airport - Suvarnabhumi International. 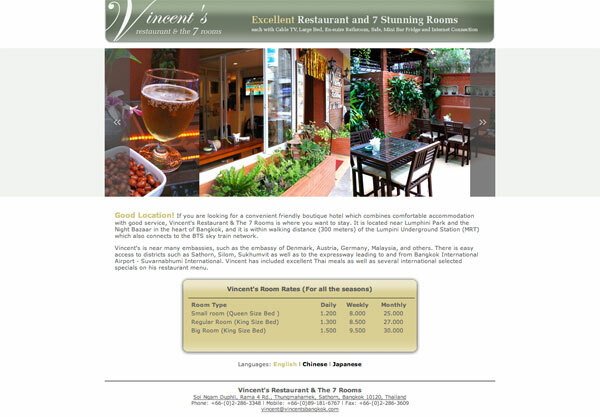 Vincent has included excellent Thai meals as well as several international selected specials on his restaurant menu. Has anyone spent time at Vincent's Hotel? Never stayed there, but they have a good restaurant on the ground floor. It has inside and outside seating, so smokers should be happy! I did stay at Vincent's last September. The rooms are very basic, and can be had for as little as 1,000 baht a night, a good and very rare bargain in older building. His place is across the street from The Pinnacle, and within walking distance to the MRT. I told Vincent I would stay until I could find a permanent residence and he was very agreeable to that. His restaurant has very good food, both farang and Thai, and is delicious. He is on Facebook a lot and specializes in unbeatable desserts. His staff is mostly Thai with at least one waiter who comes from Taiwan. Not surprising, since Vincent is Taiwanese himself. Excellent English, but admits to a languishing vocabulary in Thai. Vincent has a great personality and will go out of his way to make you happy. The only bad thing is the whole place (including restaurant) closes on Sunday, but hey, everyone needs a rest. Recommended for those on a budget. Did not stay but lunched there and food was excellent. Will return. Vincent's was closed for renovations mid April . The restaurant moved to where the Mali was (about 100 m south of Malaysia hotel, then turn right), they don't offer accommodation any more.